Here’s a list of the most amazing information about the gigantic Japanese Spider Crab. 2.) It is known scientifically known as Macrocheira kaempferi. 3.) This marine crab species can be found in the waters of Japan, hence the common name. 4.) The Japanese Spider Crab has the largest leg span of any arthropod in the world reaching up to 3.8 meters or 12 ft from claw to claw and weighing up to 41 pounds or about 19 kg. 5.) The body of this crab may grow to a size of 40 cm or 16 inches. 6.) The Japanese Spider Crab is unique from all other crab species. The first pleopods of males are unusually twisted, and its larvae appear primitive. 8.) The Japanese Spider Crab is orange, with white spots along the legs. 9.) Japanese Spider Crabs can be found off the southern coasts of the Japanese island of Honshu, from Tokyo Bay to Kagoshima Prefecture. 10.) They can also be found in Iwate Prefecture and off Su-ao, Taiwan. 11.) This unique marine creature can be found at depths of up to 600 meter, or as shallow as 50 meters. 12.) The Japanese Spider Crab is one of the most unusual aquatic pets in the world and requires a huge tank. 13.) In its natural habitat, this crab species feeds on animal carcasses and shellfish. 14.) The Japanese Spider Crab is one of the longest living creatures in the world living up to 100 years. 15.) Be careful in dealing with this gigantic crab because it has been noted that the crab was known to the Japanese for the serious injuries it can cause with its strong claws. 16.) This arthropod is edible and is occasionally collected for food with a total of 24.7 tonnes collected in 1976 and 3.2 tonnes in 1985. 17.) This crab which is subject to small scale fishery is centered in Suruga Bay. 18.) The population of Japanese Spider Crab has decreased in number, forcing fishermen into exploring deeper waters in order to catch them. 19.) 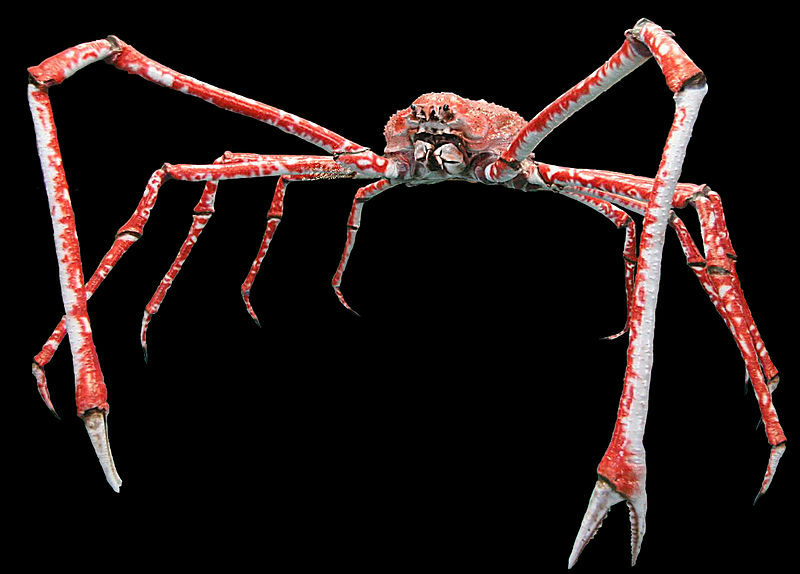 The average size of Japanese Spider Crab caught by fishermen is a leg span of 1.0–1.2 meters. 20.) When its legs are spread out, an adult giant Japanese spider crab can measure 12 feet across and its body can grow to be 15 inches wide. 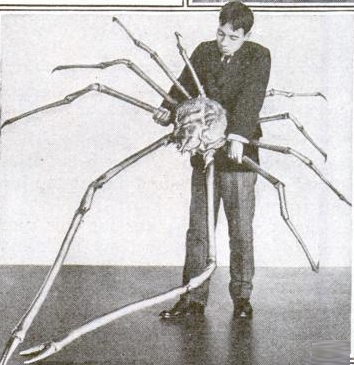 I love this blog because i needed info in the Japanese spider crab for a project. THANKS! I'm with Cooper, I needed it for a science project THANK YOU LOTS!!!! I love crabs CRABS! CRABBIDYCRABBIDYCRABS! Thanks for sharing these amazing facts. This spider really big! I would not want to meet him in the street. really helpful as thus was needed for a last minute project that i completely forgot about!